Many of you know CURE magazine as an invaluable resource for Cancer patients. 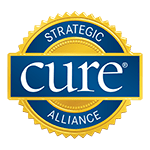 The MpBC Global Alliance is proud and excited that we have been recognized as a Strategic Alliance Partner of CURE. Looking forward to moving ahead together and potentially seeing Metaplastic Breast Cancer discussed in this global magazine! For more information about RDR’s Strategic Alliance Partnership program, click HERE.